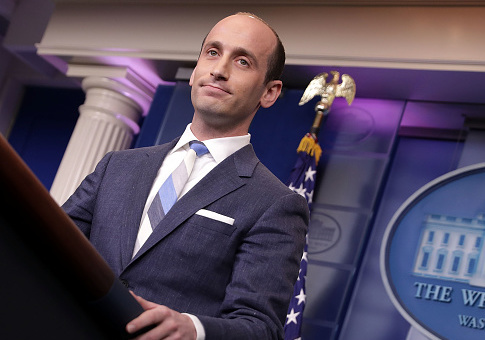 Politico Magazine on Friday published an op-ed written by a former classmate of Stephen Miller detailing the quirks of the now-White House policy adviser when he was in third grade. "I Sat on the Other Side of Stephen Miller's First Wall," wrote John Muller, who attended Franklin Elementary School in Santa Monica, California, with Miller, a key architect of the Trump administration's immigration policies, decades ago. "It's hard to say how much a kid's behavior in third grade can really tell you about the inner workings of his soul," Muller admited, before plowing on. He wrote that it was difficult to make Miller laugh, and remembered that Miller did not laugh at all at a story he wrote about a chicken. "Stephen Miller's First Wall" was evidently a boundary made of white masking tape he used to keep their desks separated, which Muller said "struck me as odd." "I was a fairly neat kid, at least at school, and I had never spread my things to his side of the desk. Stephen, meanwhile, could not have been much messier: His side of the desk was sticky and peeling, littered with scraps of paper, misshapen erasers, and pencil nubs," he complained. "Stephen picked at it with his fingernails, methodically, in a mixture of absentmindedness and what seemed like channeled hostility," he added. "This process of effacement left a thin layer of sticky grime, not altogether dissimilar from the rest of Stephen's desk." Muller was just as angry about Miller's glue habits. "He liked to pour it into his hands, forming grime-tinted glaciers in the valleys of his palms. Glue thusly in hand, he deployed his deepest powers of concentration to watch these pools harden," he wrote. In the concluding paragraph, Muller tried to draw a parallel between Miller's unclean desk in childhood and his politics as an adult. "It is at least poetic that Stephen was bent on building a nonsensical wall even back then, a wall that had more to do with what lay inside him than with what lay beyond. He thought he was trying to keep out the chaos of the world, when really he was looking for a way to explain away the chaos on his own side of the desk. For that was where chaos had always been," Muller concluded. This entry was posted in Politics and tagged Politico, Stephen Miller. Bookmark the permalink.